In just the last month, late-night clown Jimmy Kimmel mocked Trump's Slovenian accent, CNN contributor April Ryan attacked her as "not culturally American," former Hillary Clinton spokesman Philippe Reines derided her genteel presence at former first lady Barbara Bush's funeral, and horror writer Stephen King snickered at her hospitalization this week for kidney surgery. Yet, while partisans in the political press and entertainment media work hard to stoke division against and resentment of the Trump administration, "Melania" is now among the fastest-growing baby names in the nation, according to recently released Social Security data. 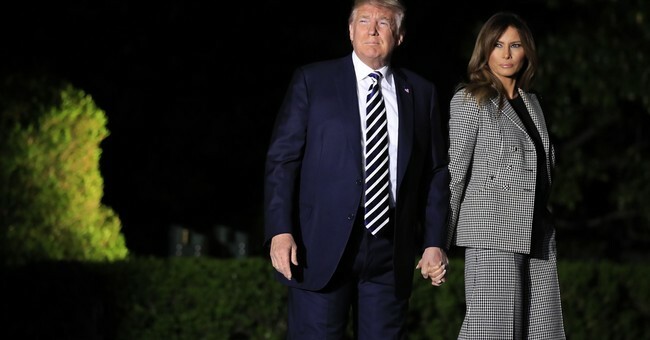 And a new poll by anti-Trump CNN released on Monday reported a 10 percent jump in the first lady's favorability ratings -- from 47 percent in January to 57 percent last week. Despite Trump's successful career as an internationally photographed model featured in Harper's Bazaar, GQ, Vanity Fair and Vogue, lib-dominated fashion and celebrity magazines have shunned her. Pop culture editors and producers -- who turned Barack and Michelle Obama into the Beltway Brangelina, promoting their election campaign, re-election campaign, books and every last pet project -- have ghosted her. Melania Trump is not just strikingly beautiful. She is worldly, well-traveled and well-read. She speaks English, French, German, Italian and Serbian, in addition to her native Slovenian -- more languages than any other woman who has served as America's first lady. Her devotion to son Barron is exemplary. Her aversion to limelight and lack of political ambition are refreshing. So is her ability to refrain from public grievance-mongering over "sacrifices" and trade-offs made between work and home life (looking at you, Hill and 'Chelle O). More exposure to this interesting and remarkable woman would mean more familiarity with her. More familiarity with her might mean more popularity. And God forbid there be more Republican women in the public eye who can compete with -- and win against -- the usual parade of militant kvetchers and moaners who pass themselves off as feminist role models. When leftists can't win on their ideas, they resort to marginalizing the messengers of ideology they abhor -- and their mates. It's not an attractive look.